LAS VEGAS, NV--(Marketwired - Apr 2, 2015) - Breast lift surgery, medically referred to as mastopexy, is one of the most popular cosmetic enhancement procedures in the nation, according to recent statistics by the American Society for Aesthetic Plastic Surgery. In 2014, nearly 133,000 mastopexy operations were performed in the U.S. alone. Dr. W. Tracy Hankins and Dr. Samuel M. Sohn, Las Vegas plastic surgeons, suggest that the reason patients commonly desire a breast lift may be due to the wide range of customization options. However, they continue, this can also lead to confusion about costs, incision options, breast implant options, and a multitude of other details that can depend on the unique needs and goals of the individual. Patients new to researching mastopexy often wonder whether it may be possible to undergo a breast lift without scars, reveals Dr. Sohn. He says that while no breast lift surgery can be performed without at least one incision, there are minimally invasive options for qualified candidates, and in many cases the scars heal well enough that the marks are not highly visible. He notes that most women report high satisfaction with their results and do not mind the scars. During the breast lift recovery experience, he emphasizes that individuals can optimize healing by following the instructions of the surgeon. Some of the typical recommendations include not engaging in activities that involve lifting, pushing, or pulling, he explains, and the final results will not be visible for three to six months, longer if breast implants were used, so patience is essential. Pricing is another common concern, Dr. Hankins adds. While patients should focus on choosing a board-certified plastic surgeon with extensive training in mastopexy and who makes them feels comfortable, he says he recognizes the desire to compare breast lift surgery costs to determine the best offer. Many factors will contribute to the final cost of a procedure, he states, including fees for the surgeon, anesthesiologist, surgery center, pre and post-operative care, and more. He also indicates that the geographic location and surgeon's years of experience can also impact the quoted price, which generally will be between $8,000 and $14,000. Ultimately, Drs. Hankins and Sohn believe the better informed a patient is the happier she will be with her outcome, and they strive to provide open and honest advice about all aspects of the breast lift experience. Mastopexy is not just about restoring the breasts to a more youthful size and position, they explain, this procedure also can potentially improve self-esteem and help women feel whole and beautiful again after having children, gaining or losing weight, or experiencing the natural process of aging. Emphasizing advanced techniques, world-class care, and the safest experience possible, the co-founders of Hankins & Sohn Plastic Surgery Associates, Dr. W. Tracy Hankins and Dr. Samuel M. Sohn, are dedicated to providing an exceptional experience for patients seeking surgical and non-surgical cosmetic enhancement, including breast augmentation, facelift, liposuction, and dermal fillers. With two offices in the Las Vegas and Henderson, Nevada area, the board-certified plastic surgeons strive to meet the needs of a diverse clientele while maintaining a compassionate and welcoming environment. 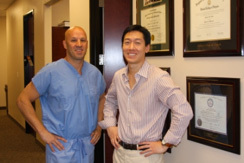 For more information about Dr. Hankins, Dr. Sohn, and their practice, please visit hankinsplasticsurgery.com.